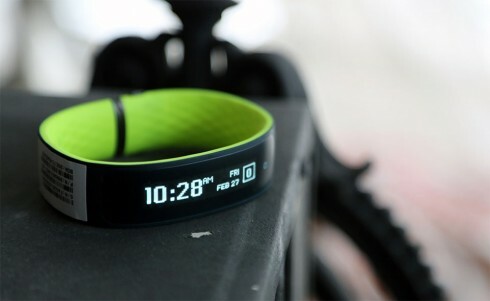 A fitness band developed by HTC Corp. and Under Armour Inc. (UA), a U.S. sports clothing and accessories supplier, will be delayed until later this year, Taiwan’s Central News Agency reported Monday. The HTC Grip, unveiled in March at the Mobile World Congress show and originally scheduled for a springtime launch, should be available with the “entire product portfolio later this year,” according to the Central News Agency. “Through our partnership with Under Armour, we have continued to refine our vision and approach to the health and fitness category,” HTC said in a statement. The HTC Grip features a 1.8-inch PMOLED flexible display, 16MB of flash memory, 8MB of SRAM and a 100mAh battery that lasts for up to 2 ½ days on a single charge. The water-resistant band is also compatible with the iOS and Android operating systems. The new product portfolio will be powered by the health and fitness app UA Record. The features of the UA Record app include motion and GPS activity tracking from mobile sensors and third party devices, analysis of individual workouts and a total snapshot of the user’s progress, including steps, sleep, calorific burn, heart rate and weight.